We work the hides. We tan to manufacture products of the highest quality. 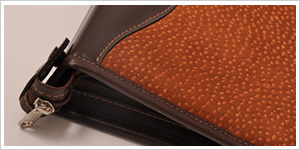 Wallets made in 100% natural leather. Excellent finishes and fittings. We seek to be attentive to the changing fashions and trends, assembling collections based on 3 main concepts: originality, quality and detail. 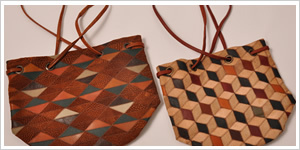 We use leather as a medium in color and varied textures, with the idea of offering unique products in design. We offer an attractive collection of schedules with the finest features. Featuring original designs with practical and comfortable closures, and big sheets available for added functionality. Being made with natural leather, they have a particular style. 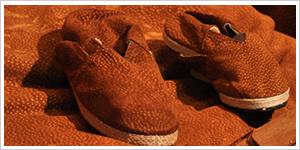 We manufacture exclusive capybara leather espadrilles. Made with jute sole basis with vulcanized rubber to prevent moisture in the foot. Completely hand sewn with thread of jute, excellent finish. 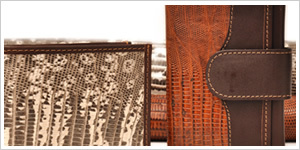 Our exclusive designs in handbags offer a variety of models, color combinations and exquisite finishes.